Ralph and Sharleen's Road Trip. In late September, 2007, Ralph and I were able to fulfill a long time dream that many other car buffs probably have on their lifetime list of things to do before they no longer can... drive cross country (well, 2/3rds, anyway) in a classic car- a convertible, no less! 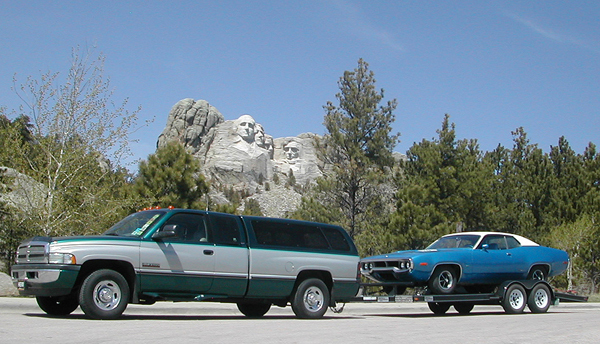 The plan was to fly out to Minneapolis, Minnesota, rent a car, then drive to Fargo, North Dakota to purchase a classic car and drive it back to Connecticut. 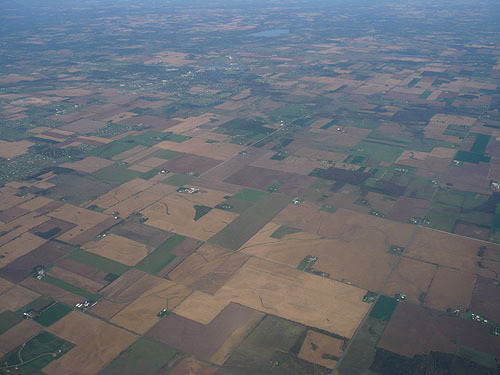 We flew out of Connecticut before the crack of dawn on Friday September 28 and landed in Chicago's O'Hare Airport about 8 am. We had a connecting flight out of Chicago's Midway Airport. Ralph had the foresight to arrange for a car service to pick us up and get us from O'Hare to Midway. We waited with our luggage outside looking for a Cadillac Escalade that we were told would pick us up at approximately 8:30 am. Like clockwork, our driver pulled up in a squeaky clean Escalade. 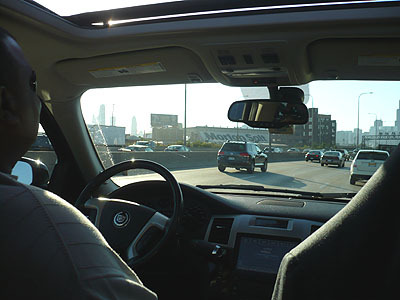 We introduced ourselves to our driver, got our gear in the back of the vehicle, and headed off to the other airport, during Chicago's rush hour traffic. Driving through Chicago can be a little hairy anytime, but more so during rush hour. However, there was no need to worry. Our driver, Howard, had it under control. He was a big man with an even bigger personality. We were going to all be in the Caddy together for a while, considering the traffic, so we made small talk. It didn't take long for us to find common ground to discuss- Food! And, I had just recently gotten a new issue of Saveur magazine that was all about the great food and food specialties in Chicago. Pizza, sausages, mother-in-law sandwiches, Italian Beefs (wet or dry, or as Howard suggests, with a light dip), Dogs- Howard told us where we could get them all, and the best way to eat them. Heck, he even offered to take us to get a Kielbasa or sausage sandwich. At 8:30 in the morning? With another airplane flight ahead? Neither me nor Ralph thought our stomachs could handle it that early in the morning. 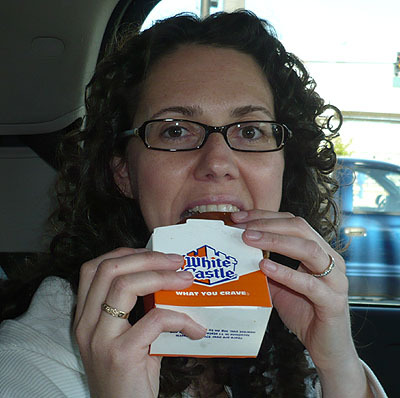 But, Howard did persuade us to let him stop at White Castle for some breakfast. A breakfast of hamburgers with onions, pickles- the works. How bad could it be? They're only little hamburgers, right? So, we went through the drive-thru, got our burgers, and swallowed them down in a hurry as we had to get to the airport. Howard got us safely to Midway Airport, dropped us off and wished us a safe trip. Ralph and I told him if we ever made it back to Chicago, we were going to look him up to help us eat our way through Chicago. As we made our way to the gate, we both began to realize that little burgers with the works at 8:30 in the morning were probably not a great idea after all. We tasted them all the way to Minneapolis, and then some. Yum! Onions and pickles before 9 am! When we landed in Minneapolis, we decided to see if we could get a cheap flight to Fargo, North Dakota, our final destination. Turns out, there are no cheap flights to Fargo, only very expensive ones. So, we resorted to our original plan to rent a vehicle to drive the remaining 300 miles to pick up our new car. After we picked up our rental car, the first stop was at Walmart to stock up on provisions for the trip. My lifelong friend Laura and her husband Morgan and daughter Greta live in Minnesota, so the goal was to get the car in Fargo, turn around and return to Minneapolis to return the rental car, and be at Laura's house early evening.